Last week, I had to prepare and send a swap package to a buddy in one of my Ravelry groups. One of the requirements was that there be some sort of ornament included with the other goodies. I knit Christmas lights when I participated in this swap a couple of years ago and was… less than satisfied. They turned out like little jalapeño peppers. Cute, but not what I was going for. 239, a photo by ArbreDeJosue on Flickr. CO twice the number of sts in your chart + 8. (This will provide you with a 2-stitch border on both sides of the chart on both sides of the ornament; if you’re going to knit a continuous band/border motif, just cast on the number of sts that you need since no border sts to separate motifs are necessary.) Use a fairly elastic cast-on method, or CO with needles that are a size or two larger than what you’ll use for the main body of the ornament, since stranded colorwork is less elastic than plain stockinette. Using MC, knit 2 rows in St st.
Work your chart, but if you’re working a single motif on each side and not a continuous band, DON’T FORGET to knit the 2 border sts at the beginning and end of each chart repeats. I think I tinked three or four rows because I started right in on my chart on this sample. D’oh. Once the motif’s done, using MC again, knit 2 rows in St st.
Bind off, again using a stretchy bind-off method or larger needles. Wet block to size desired. Be patient and let the thing dry. Needle-tweak any troublesome spots in your colorwork. Using CC, whipstitch both edges closed. 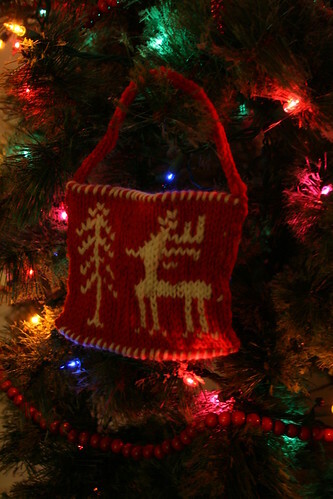 Knit i-cord that measures (the length of your ornament + 1″ / 4cm), leaving a 6″ tail on both ends. The tails will be used to secure this i-cord hanger to your ornament. Use the tails to sew each end of the i-cord to the top corners of the ornament; if your ornament is much larger than about 4″/18 cm square, however, you may want to attach the i-cord hanger an inch or so in from the corners. The sample ornament was somewhat heavier than anticipated and bows in the middle. Boo.